Shovel blade fitted with aluminium edge / protector. Aluminium tubular shaft with polypropylene shovel and handle. 3 piece compact snow shovel. Keep shovel in the car or garage for those unexpected snow falls. 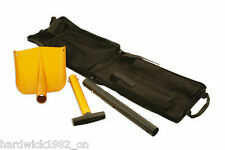 Sealey 3pc Auto Snow Shovel Kit. Shovel Head (W x D): 245 x 345mm. Cycle Accessories & Parts (72). Cycle Maintenance/ Repair Kits (28). Garden (8). Haynes Motorcycle Manuals (19). Air Line Tools & Couplings. Snow Grabber Mats by Summit. Cycle Accessories & Parts (72). Cycle Maintenance/ Repair Kits (28). Car Mats (15). Car Care & Cleaning Products (100). Haynes Motorcycle Manuals (19). Air Line Tools & Couplings. 3 in 1 Snow brush with ice scraper & Squeegee. Cycle Accessories & Parts (72). Cycle Maintenance/ Repair Kits (28). Squeegee /Wiper blade width 9.4cm. Garden (8). Brush length 17cm. Haynes Motorcycle Manuals (19). 93cm when fully extended. 74cm when adjusted to smaller size. Cycle Accessories & Parts (72). Cycle Maintenance/ Repair Kits (28). Fits neatly into car boot and is ideal for use with snow, mud, sand and more. Kompakte Schneeschaufel. EINFACH ZU DEMONTIEREN FÜR KOMPAKTE AUFBEWAHRUNG 94 cm. AUF DEN DRUCKKNOPF DRÜCKEN UND DER SCHNAPPVERSCHLUSS SCHLIEßT SICH. 0.75M Snow Shovel. 75cm Snow Showel. Rust Resistant Plastic Shovel. Ergonomic Handle. Head Size 39.5 x 30.9CM. Pet Care (4). New Arrivals. Other (346). Schaufel / Schneeschaufel ausziehbar nicht nur für Schnee. Ideal for use in adverse weather conditions, this foldable snow shovel is lightweight and compact. Also ideal for outdoor excursions. Light and compact. Folds for compact storage. Box Contains. CarPlan Snow Treads. Bluecol Snow Treads. Car Mats (15). Instant winter traction for your car, van or trailer. These studded mats are designed to provide the traction you need in an instant. Air Line Tools & Couplings. Shovel Head Length:31cm. Shovel Head Width:26cm. Schaufel / Schneeschaufel ausziehbar nicht nur für Schnee.für unterwegs super praktisch. 83 cm x 27 cm.